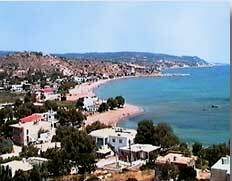 Komi is located 4 kilometers south of the village of Kalamoti and is amongst the loveliest beaches of Chios. Its shallow, warm waters and fine sandy shores are suitable for beach games and sunbathing. There are apartments, rooms to let, restaurants, taverns, bars and discos available to meet all visitors’ interests. The permanent residents of Komi are few and occupy their time with fishing and horticulture. The majority of Kalamoti’s residents live in Komi during the summer.